Added to your bedroom suite, our handcrafted Berkshire Colonial Sleigh Bed will offer an authentic, antique feel throughout your entire decor. The traditional sleigh bed shape of the head and foot boards are complemented beautifully with the curves of the top, rope molding below, and raised panels in between that all provide a timeless charm and plenty of character at the heart of the room. 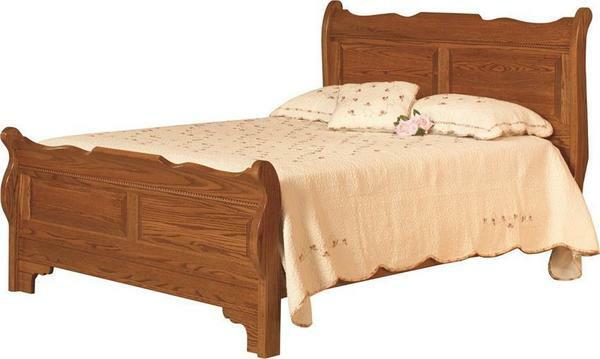 This high-quality sleigh bed is hand-crafted by skilled artisans in the heart of Holmes County, Ohio. Combining the best North American hardwood with techniques that have been handed down and perfect for decades, and a true love for the craft, this bed is worthy of becoming a family heirloom and is sure provide generations with timeless charm and everlasting quality. True to the term "handcrafted" - each piece is bench built to your order. From the options above, choose your preferred size to fit your unique space, along with the perfect hardwood and finish combination that will complement your decor - your new bed will be constructed, wrapped carefully, and shipped directly to your home, ready to use and enjoy for a lifetime. We understand that investing in furniture may, at times, seem like a daunting task - but we're here to help you through the process and answer any questions you have. Just a phone call away, our furniture specialists are available to walk you through the process, help with any questions or concerns, and provide you with stain samples while you wait to ensure your new furniture is just what you want. We can also provide free custom quotes to tailor this piece to suit you individual needs. An inch off here, no rope molding, etc. Just give us a call and we'll help you furnish the bedroom oasis of your dreams.